Even when our intentions are positive, we only see our perspective. A new principal saw how hard the high school students were working and wanted them to have a break and a “real” holiday. She wrote a note to all teachers telling them not to schedule tests or papers due the week after a holiday. She wanted the students to be able to take a real break. However, her goodwill gesture was not received with joy by all. Many teachers were upset since they had a curriculum they were following and then decided to test the kids prior to the vacation. The students and parents complained that they ended up having many tests and papers due prior to the break. Other administrators complained because they ended up proctoring tests late into the evening prior to the holiday. When we see something so clearly it is hard to remember that others may be seeing a very different perspective. 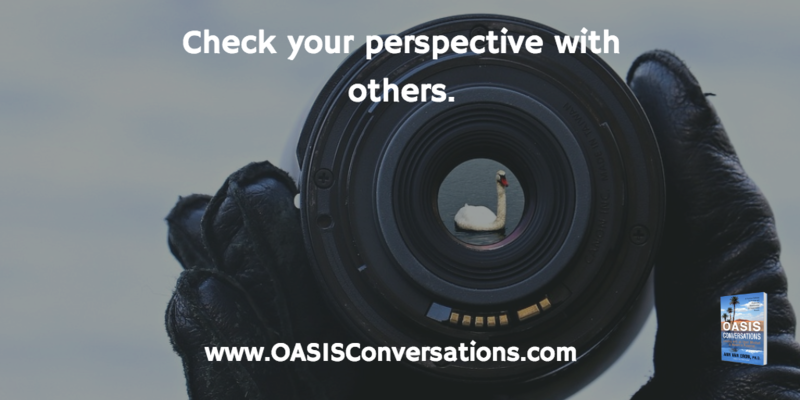 Check your perspectives out with others who may be impacted by your choices.